So you´re wondering how to get a clear face? Well, it's everyone's dream to have one, acne-free, no large pores, and free from blemishes and scars. The good news is, achieving a clearer, healthier and more rejuvenated face can be easily achieved with our top proven methods. Before we proceed to the actual solution, it's important to know that skin care routine varies depending on your skin type. Each skin type requires a distinct treatment to account for such differences. 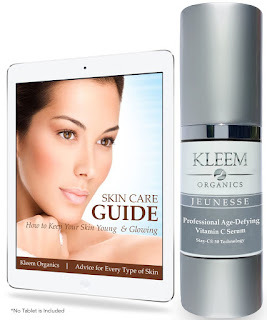 • Your face has a smooth surface, no blemishes, and enlarged pores. • You have minimal to no fine lines and wrinkles. Essentially, this is the ideal type of skin that we all want to achieve however just because it seems flawless and perfect, it doesn't mean that you are exempted from a skin care routine. On the latter part of this article, we'll be discussing the appropriate maintenance routine for normal type of skin. People with oily skin have overly active sebaceous glands, producing more oil than necessary. This can be caused by certain factors like diet, hereditary, hormonal levels, stress. One way to confirm that you have an oily skin is to wash your face then wait for 2 hours. If your entire (not on particular areas only) face looks shiny and greasy, you probably have an oily type of face. 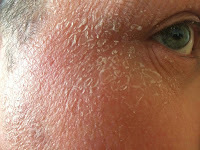 Photo showing a dry type of skin. • dull and rough complexion. People with dry face are advised to use products rich in moisturizing agents. On the latter part of this article, we'll show the proper skincare regimen on how to get a clear face for those who fall under the dry type of skin. Basically, this is the most common skin type among men and women. Under this classification, you're face is only oily on your t-zone area. This includes your chin, nose and forehead. The other parts are either normal or dry. Combination also pertains to a condition where wrinkles, rosacea, breakouts and dry skin are present at the same time. Gentle products should be used for this type so as not to aggravate the problem. Below will be shown the appropriate steps on how to get a clear face if your have a sensitive type of face. You've to be thankful if you fall under this category. You're already blessed with such skin. With that being said, your regimen for a clearer face must not be that complicated as compared to others. Having a "blessed" skin doesn't exempt you from regularly cleaning your face. This is to avoid clogging your pores which can eventually lead to breakouts. To do this, choose a gentle cleanser that effectively removes deep seated dirt. You don't need a face wash that contains moisturizing or oil control agents. As a rule of thumb, wash your face twice a day (don't go beyond that), one every morning and one in the evening. We recommend using Nuetrogena Healthy Skin Cleanser which perfectly suits your normal type of skin. It contains salicylic acid which is known in preventing blemishes. It also contains anti-aging properties that helps fights the scary signs of aging like fine lines and wrinkles. Toning your face is as equally important as cleansing your face. Your face/skin has a normal pH level of 5.5 and water has a pH level of as high as 9.0 depending on your location. When you wash your face, it completely distorts your face pH level. By using a toner, you instantly bring back the natural pH level of your face. As to the frequency of using one, use toner right after every wash. On a piece of cotton, put 5-6 drops of toner and gently apply it to your face on a circular motion. If you're looking for a toner that will suit your normal type of skin, Nu Skin Nutricencials pH Balance toner is best for you. This is essential to all types of skin. UV rays are too harmful to our skin and this leads to premature aging. Wearing sunblock with as high as SPF 25 sun protection can is advisable each time you go outside. One of the highly reputable brands when it comes to face's sunblock is the Neutrogena Clear Face Sunblock. This is perfect for any type of skin. Blackheads are deeply seated on your pores and unless you use a peel-off mask, it doesn't go away on its own. Freeman Cucumber Facial Peel-Off Mask is best for you. Whenever you use a peel-off mask, be carefully not to apply it on the hairy areas of your face like your brows. Apply the peel off mask and let it dry for 15-20 minutes. Then after that, from your chin, peel the mask upwards. How often should you use peel-off mask? Don't go beyond twice a week. Do this right after washing your face. • If you want to diminish your dark spots and other skin tone irregularities, use Bremenn Clinical Dark Spot Eraser. 1 Fl. Oz . • Your face is not static and its condition changes depending on certain factors like weather. If you're experiencing a little bit of dryness, you may want to use a facial moisturizer that is advisable to be applied once every night. We recommend using Paula's Choice Calm Redness Relief Nighttime Moisturizer with Green Tea for Normal to Oily Skin . Apparently, one of the things that we want to combat, if you have this type of skin, is the excess sebum and we've to calm down your overly active sebaceous glands. One solution on how to get a clear face if you have this type of skin is to use products that contain Panadoxine, and Phytic Acid. Let's start first with cleansing. Just because you're oily it doesn't mean that you need to wash your face frequently. Frequent washing aggravates your problem and it can lead to irritation and breakouts. A rule of thumb is to wash your face twice daily with a facial cleanser that contains oil-control ingredients just like the ones mentioned before. For oily skin, a best facial wash for you is Neutrogena Rapid Clear Oil-Eliminating Foaming Cleanser. This product is also noncomedogenic, which means , they don't clog your pores. If you're looking for a toner that will suit your oily type of skin, Retseliney Acne Facial Toner and Oil Control is best for you. This is done right after toning your face. To completely remove the bumps and effectively control acne, you need a product that contains salicylic acid. This particular ingredient is widely used in acne medication. Though we're trying to combat acne, you still have to make sure that the products that you're using is gentle. Also, do not overdo in applying the ointments as this may burn your skin. One product that we can recommend you using is the Clean & Clear Advantage Acne Spot. Don't go beyond twice a week. Do this right after you wash your face immediately. 5. Never forget to use sunblock. While treating your oily skin, an oil control film can come in handy to instantly remove annoying excess sebum. Clean & Clear is the best brand that we can recommend to you. To use this, gently rub the film on the oily areas of your skin. Clean & Clear is available on Amazon and a pack with 60 sheets costs $10.60. Check out the link below if you want to purchase this on Amazon. Question: Is moisturizer necessary for oily face? It's not necessary as your sebaceous glands are already producing oil than usual. However, using moisturizer 1-2 a week can can also be good for your face. Your main issue is the flakiness and dryness of your face and to properly address this, using products with moisturizing and hydrating agents like dimethicone, petrolatum, and lanolin is essential. Here is the suggested skin care routine in chronological order. For dry skin, use a facial cleanser with humectant ingredients. Even though you are experiencing from flakiness, washing your face twice a day (every morning and every evening) is still necessary. For your case, we recommend CeraVe Hydrating Cleanser. It gently removes deeply seated dirt and oil which cause breakouts. This product is also noncomedogenic, which means it doesn't clog your pores. If you're looking for a toner that will suit your dry type of skin, InstaNatural Moroccan Rose Water Toner for Face is best for you. After toning your face, moisturizing it is next. You always have to make sure that your moisturizer is especially formulated for dry skin, otherwise, the ingredients may not be sufficient for your case. Shea butter and jojoba oil are two of the ingredients that you want to check whenever you're looking for a moisturizer for your dry skin. These promote deep moisturization.